To track endangered species like Cheetah, African Wild Dog, Rhino and Leopard, various forms of tracking collars are used. These include radio, GPS and satellite collars. This equipment makes it possible for Wildlife ACT’s monitors to track these animals daily, which means that if they are injured, sick, trapped in a poacher’s snare, or have escaped out of a reserve, help is not far away. Important research can also be conducted including animal movement patterns, population demographics and inter-species interactions – all to help with the future conservation of these species. Wildlife ACT is helping to develop and deploy anti-poaching collars with reinforced plates and special rivets to prevent animals like Cheetah, Leopards or Wild Dogs from choking when caught in a poacher’s snare. These collars also send out an emergency signal once a dog is stationary for an unnatural amount of time – giving monitors and rangers time to respond to an emergency. This means that a collar can literally save an animal’s life! 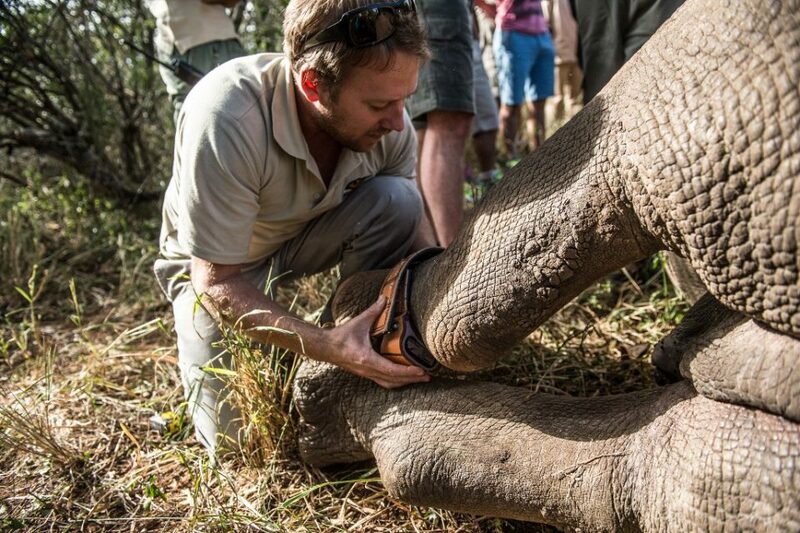 Since 2012, Wildlife ACT in partnership with Animal Trackem (a radio tracking company) have been designing, testing and deploying rhino ankle collars. These collars are a fairly new invention. In the past, neck collars have been used but unsuccessfully. 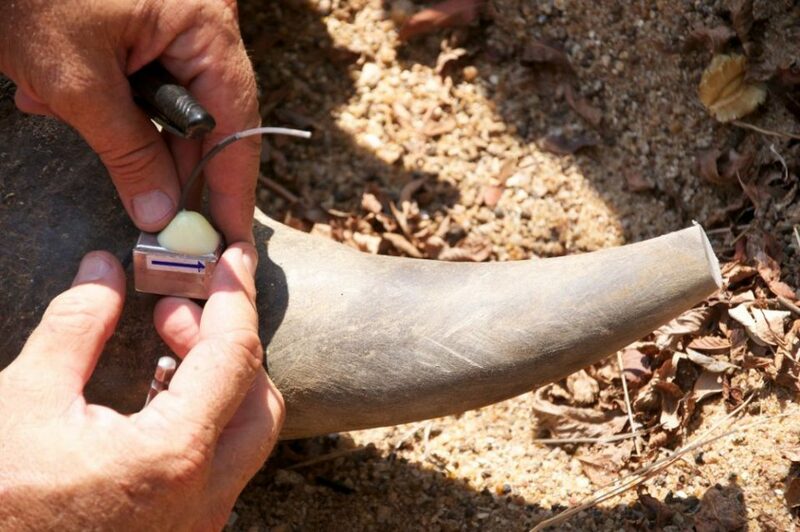 Prior to rhino ankle collars, the only successful radio tracking device that can be deployed on a rhino is a horn implant. Due to size limitations, these rhino horn transmitters are only big enough for a VHF radio tracking device (more info on these transmitters below). 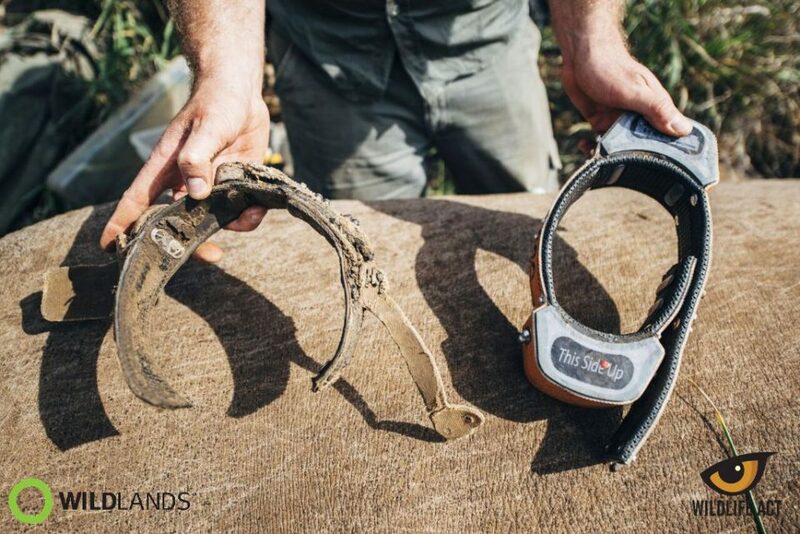 The advantage of the rhino ankle collar is that it allows for a bigger battery and device – allowing us to fit GSM (cellphone) and Satellite units to rhino. Although there is still room for improvement, these collars are working well, and have provided us with invaluable movement data, which also assists in securing these rhino. Some collars are reporting live to our control rooms which improve security efforts dramatically. 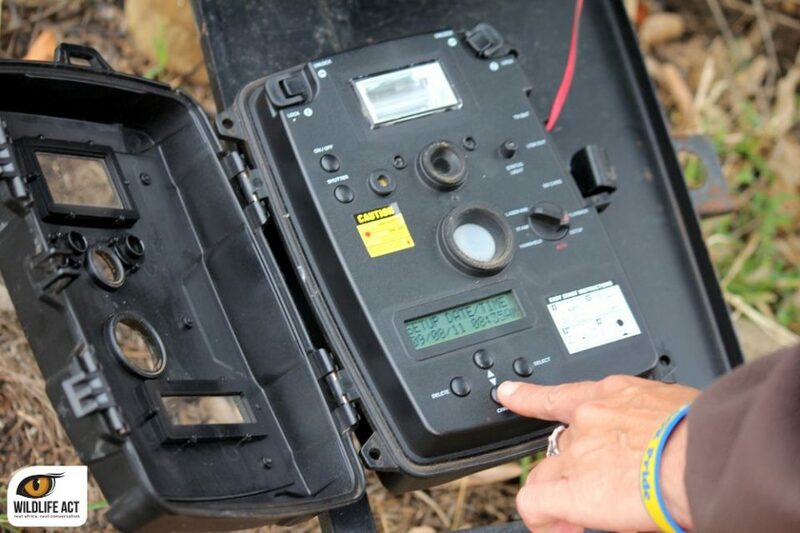 Another example of potentially lifesaving equipment is state-of-the-art anti-poaching transmitter technology that the Wildlife ACT has helped to identify and implement. These sophisticated transmitters send real-time information to monitors about the movements of the animals and their exact location. When fitted in a rhino horn, for example, the movement sensor will trigger an alarm when the rhino is in distress and can even detect when its horn is being hacked off. This gives us the opportunity to catch the perpetrators in the act. In the case of an animal caught in a snare, these transmitters give us the time to locate the animal and remove the snare before the wounds become fatal. In January 2011 (after months of planning) Wildlife ACT members formed part of a team that implemented the very first transmitter technology system by inserting these transmitters into the horns of all the rhino on a particular game reserve in Zululand, South Africa. With this system now in place, these rhino are significantly safer from poachers! Image: VHF horn transmitter before implantation. Another great way to monitor endangered species is to use remote-activated camera traps. These are essentially remotely activated portable cameras that are triggered by motion through infrared or a motion sensor. The “shots” provide monitors and researchers with fantastic information – allowing them to assess the status of endangered species on a reserve and to help develop and monitor management interventions. Camera traps can be used for numerous applications – whether it’s monitoring population sizes or to answer a specific research question. When used effectively, the information captured by camera traps can be invaluable – especially when coupled with other monitoring techniques. 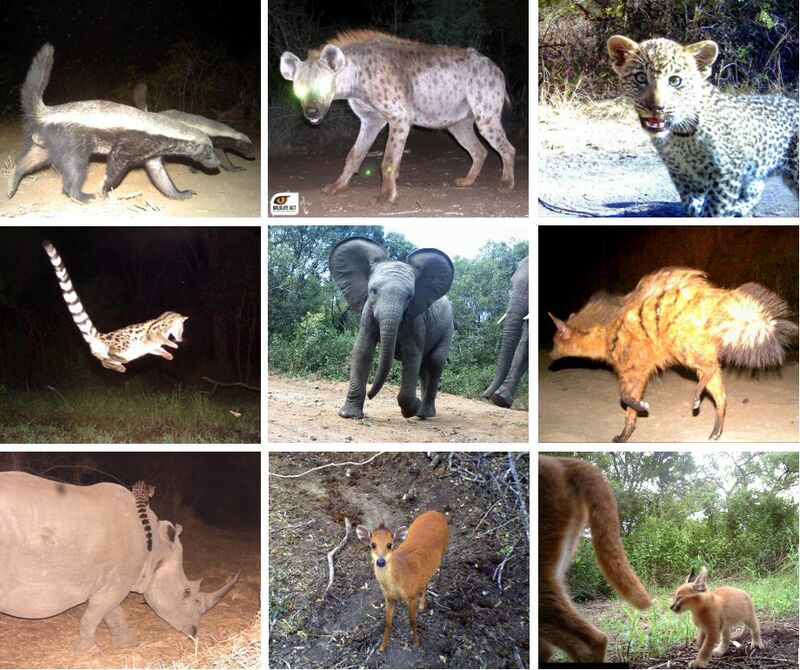 In Africa specifically, camera traps continue to be an important component of endangered species monitoring, particularly for more elusive species such as leopard and black rhino. In many areas these animals are characteristically shy and difficult to observe, which can result in poor knowledge of a population and its demographics and ultimately poor population management.